Note-taking is common practice in the higher education context, as well as in everyday professional settings. Nonetheless, it is a complex linguistic exercise that requires specific cognitive skills and strategies. The following deliberations show how note-taking can be practised in GFL lessons. While listening to a lecture, students link new facts to their existing knowledge, filtering out the salient points and noting them down as a memory aid for future use. All of these are actions that are performed as a matter of course in everyday student life and later in professional contexts. But what exactly do these actions involve? Which linguistic and cognitive demands are placed on us when we do this? And which additional problems arise when we have to understand the spoken or written word and engage in productive actions such as speaking, interacting and note-taking in a foreign language? This is outlined using the example of note-taking during a lecture. Note-taking is a technique that involves processing text and knowledge. The notes themselves are taken while listening to a lecture or presentation, and can prove useful at a later date – for example when writing an essay, doing a homework assignment or revising for a test. When they take notes, students should be able to compare what they hear – often with the aid of lecture notes or copied presentation slides provided by the tutor – with written and in some cases also visual input. In addition, they should be in a position to understand non-verbal and semi-verbal signals, and to assess these appropriately. This is particularly the case in discussions involving several people, such as those that take place during seminars or at the end of a lecture. Such signals are characterized by cultural specifics and as such are not always easy to interpret clearly, particularly from a foreign language or foreign culture perspective. Furthermore, it is of central importance for students at university to have a clear understanding of the functions of linguistic actions in academic discourse, such as argumentation, demonstration or objection. Besides the aforementioned functions of those types of texts that are relevant in higher education, they should also be able when listening (and taking notes) to recognize and understand the academic language and text-structuring elements. Only then will they be able to judge when for example a problem is being raised or references to other assessments are being made. As well as identifying key words and important information in the course of the speech, they must be capable of identifying and appraising discourse particles and non-verbal and semi-verbal markers from gestures, facial expressions or intonation. This will make it easier for them to keep track of positions and lines of argumentation, and to attribute these to the right person. Moreover, students must be able to grasp structuring methods such as cohesive elements to prepare a lecture or oral contribution so as to be able to develop hypotheses for the subsequent explanations. This in turn facilitates the reception process. Students also need to be able to link what they are hearing to their own prior knowledge and hypotheses and to check its relevance to the question on which they are focusing. In this context it is necessary to reduce reference texts (such as a lecture, for example) in terms of their quantity, distinguishing on the one hand between the essential and the non-essential, and on the other hand between new knowledge and knowledge that has already been acquired. Against this backdrop, students then need to decide what to record in the form of a note. Once students have decided on the content that they wish to note down, they have to mentally prepare it, compress it linguistically and, most importantly, paraphrase it. Individual abbreviations, notations and symbols are then used to convert it into written form in an efficient and effective manner (either using a device such as a tablet or by hand). Furthermore, students should be able to make a written record of argumentation structures: taking easily comprehensible notes of theses, antitheses, arguments and counterarguments also requires numerous additional skills. It is also important to decide whether the note should be taken in the student’s first language or in the foreign language, which presumably will depend first and foremost on the purpose for which the note will subsequently be used. It may also be that the choice of language will have consequences for the language system in which the notes are taken. The fleeting nature of the spoken word means that it is crucial for students to remain attentive while they are taking notes so as not to lose the thread and miss hearing subsequent information. After all, unlike when reading and excerpting, information cannot be repeatedly received. Nonetheless, while listening and taking notes it is worth attempting to add critical comments to notes, put individual points in wider contexts and provide them with cross-references. On this basis students will be able to develop new or further-reaching questions. Overall, the challenge in note-taking is to achieve a “mental disassociation between different communicative tasks” (Ehlich 2003: 19). In other words, students have to perform entirely different linguistic and cognitive actions simultaneously, without even having any possibility of repetition. It is therefore clear that attending a lecture or a seminar, especially in foreign-language contexts, poses a considerable mental strain. As a rule, note-taking at university is closely related to the examination requirements of the course of study. Tasks and exercises aimed at teaching these skills in language courses at levels B2 and C1 should therefore be relevant in terms of content and situation to the real context in which they will be used and to the function of the notes. Students must learn that note-taking will help them when it comes to revising for tests and that it will make it easier for them to give appropriate answers to questions in exam situations. 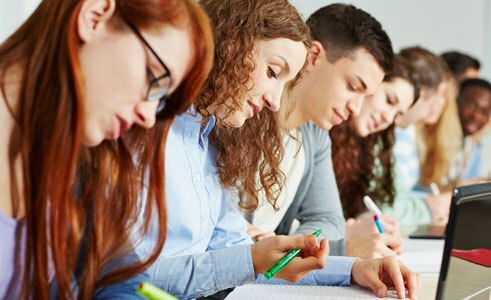 While global, selective and detailed listening comprehensions and noting what is heard form an integral part of GFL and GSL teaching from beginner level right through to C1 level, lessons themselves rarely explain exactly how notes can be effectively taken, for example in preparation for a later exam. Many types of listening comprehension exercises for instance require that learners classify information or respond to specific questions. By contrast, note-taking that is intended for exam preparation demands that learners select content that will be of relevance in the exam. In this context it is important for learners themselves to distinguish between essential and non-essential content that will subsequently help them in the exam situation, and to anticipate which questions may result from what they have heard. 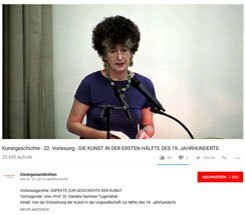 Lectures in German made available online by universities provide good exercise material. | Photo: © University of Applied Arts Vienna To this end, teachers should initially sensitize learners to the need for structured note-taking that contains key information in abbreviated form. Concrete examples should be given so that students can work out which criteria will be relevant when they are taking their own notes. In this context teachers can take advantage of the lectures that are accessible online in the Massive Open Online Courses (MOOC). Numerous German universities make their introductory lectures in different subjects available free of charge as an online course, in some cases with additional materials and slides. We feel that it is important for skills such as note-taking in lectures or work meetings to be incorporated into GFL lessons that are designed to prepare for or accompany a course of university study. This is because such skills are not acquired of their own accord during the course of study (incidentally, this is not even the case with students whose first language is German). Instead, we should systematically integrate them into our lessons in an action-oriented manner, as in the example given. This will help foreign students to study effectively and cope with the enormous workload involved in processing knowledge. Arras, Ulrike (2015): Mitschreiben als hochschulrelevante Sprachhandlung – kann das eine Sprachprüfung testen? In: Knapp, Annelie/Aguado, Karin (Ed. ): Fremdsprachen in Studium und Lehre – Foreign Languages in Higher Education. Chancen und Herausforderungen für den Wissenserwerb – Opportunities and Challenges for the Acquisition of Knowledge. Frankfurt am Main: Peter Lang, p. 209-245. Banzer, Roman/Kruse, Otto (2011): Schreiben im Bachelor-Studium: Direktiven für Didaktik und Curriculumentwicklung. In: Berendt, Brigitte /Voss, Hans-Peter/Wildt, Johannes (Ed. ): Neues Handbuch Hochschullehre. Lehren und Lernen effizient gestalten. G 4.8. Berlin: Raabe Verlag, p. 1-37. Ehlich, Konrad (2003): Universitäre Textarten, universitäre Struktur. In: Ehlich, Konrad/Steets, Angelika (Ed. ): Wissenschaftlich schreiben – lehren und lernen. Berlin u.a. : De Gruyter, p. 13-28. Dr Ulrike Arras works as a junior professor at the Competence Centre for Language Studies at the Free University of Bozen/Bolzano. In her research, she focuses on evaluating foreign language skills, and on multilingualism, especially mediation in multilingual academic contexts. Tanja Fohr works as a trainer for teachers of German as a foreign and second language at the University of Kassel. Her research focuses on Content and Language Integrated Learning (CLIL), language in art lessons, experience-based teaching and learning, and the integrated teaching of academic language.